THERE hasn't been just one player Adelaide defender Wayne Milera has modelled his game on since making the switch to half-back. He's studied Brodie Smith and the way he attacks out of defence, Rory Laird's positioning and the way he finds so much of the ball, and Luke Brown's skill as a lock-down small defender. "When Brodie's been out there training with us, he's been helping me a lot with things I need to do," Milera told AFL.com.au, ahead of Saturday night's crucial encounter with Melbourne at Adelaide Oval. "He's helped me with game film over the pre-season. "I'd watch vision of 'Lairdy', 'Smithy' and 'Browny', because he's a really good one on one defender." It was Smith's torn ACL in last year's qualifying final that forced the Crows' coaching staff to think laterally for a replacement. They looked at Milera's weapons – his ability to read the play, pinpoint kicking and pace – and thought they could help him successfully make the switch from his previous roles as a winger and half-forward. "It was a bit of a shock, because I only played the one game (in under-18s at half-back)," Milera said. "I knew 'Smithers' was out for a year, but I didn't think they were going to chuck me in there. "They hadn't mentioned anything to me at all, then in the exit meeting (in October), they said we'll see how you go in the pre-season, just train there, see how you go." Since being moved to half-back for the round five win against Sydney, Milera has had 20 or more disposals in five of his 11 games, the highlight a career-high 33 touches against Gold Coast in round six. In contrast, he had just three games of 20 or more disposals in his first 24 games in the past two seasons since being taken with the No.11 overall pick in the 2015 NAB AFL Draft. "All the backline have made me feel comfortable out there," he said. "It's pretty easy to come in with everyone being so organised and set up. "It's about defending first, and when we're in attack, play my natural game and take the game on and just play." 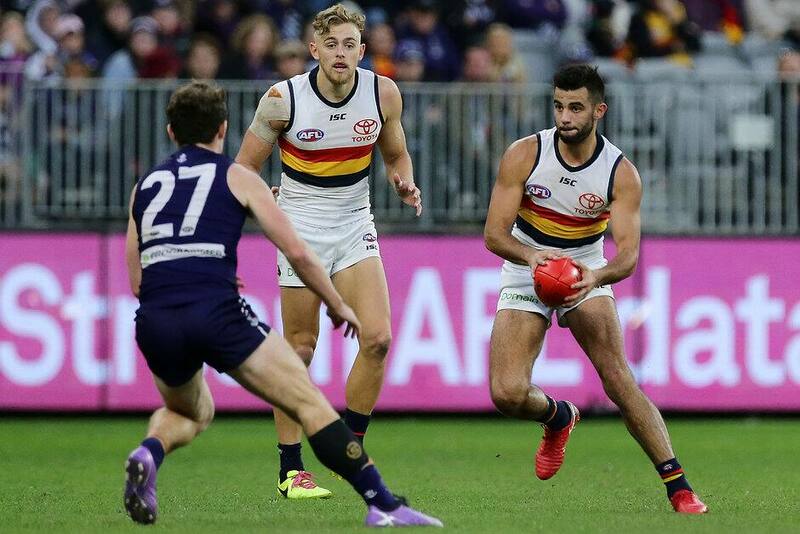 Milera's run and gun style of play from half-back has earnt the 20-year-old comparisons to Crows great Andrew McLeod. The nephew of Sydney legend Michael O'Loughlin is taking it all in his stride as he aims to cement his spot in the side. Milera couldn't command a regular spot in the Crows' best 22 in his first two seasons, and was overlooked for last year's finals series. "It gave me a bit of motivation over the off-season to make sure it didn't happen again," Milera said. "That was one thing last year, I was a bit inconsistent. "I made sure I stuck to the program during the off-season and did some extra stuff when I could." Milera was hampered by patella tendinitis that forced him to miss the start of the season, but he's been able to successfully manage the knee injury since. The Crows have eight changes to the side that was embarrassed to the tune of 91 points when they faced the Demons in Alice Springs in round 10. Milera said the Crows learnt some important lessons from that defeat. "They gave us a touch-up inside at the contest," Milera said. "If we don't play well in the contest and put enough pressure on, we get scored on pretty easily. "That's one of the main things we learnt, we need to apply plenty of pressure and try to slow the ball movement down."